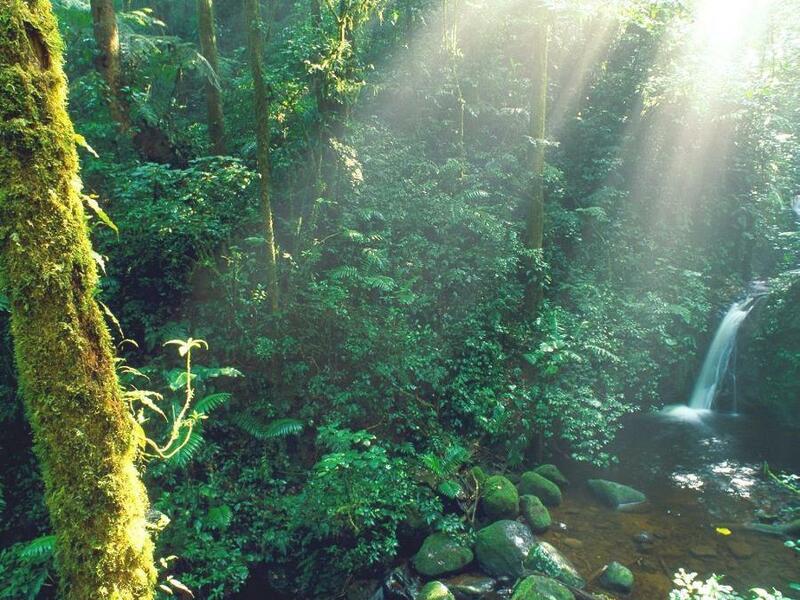 A glimpse into the depths of the Monte VerdeCloud Forest in Costa Rica. How could anyone be delusional enough to think they could reproduce this in a cage? Our thanks and admiration to Larry Loos who very kindly supplied this amazing photo. It is difficult to appreciate the magnitude of mortality rates in nature. Let's consider a generic tarantula: The female matures at age five years and dies at age twenty. Her reproductive career is fifteen years long. During that time she mates with one male per year and produces one eggsac of 200 babies per year. Thus, during her life she produces 15 X 200 = 3,000 babies. If the population of her species is to remain stable over the long run, she must replace herself and fifteen males, a total of sixteen offspring. All the rest of those 3,000 babies (3000-16 = 2984) must die. The mortality rate is a brutal 2984/3000 X 100 = 99.47%! Must have absolutely no defects. An hypothesis that seems to persistent endlessly on the Internet arachnid forums is that any given organism has evolved hand-in-glove to interact optimally with its environment. And this implies that "Natural Is Better." Thus, the story goes, if your pet tarantula isn't kept in some arrangement that closely mimics its native habitat; your newfound, little buddy will immediately go into a tailspin, crash, and burn! This hypothesis was especially popular in the idealism of the eighteenth and nineteenth centuries (and probably much earlier), and suffered another revival in the 1960s. But we now know that the earlier occurrence was based on a delusional view of reality, and the last resurgence to be a product of too much weed being blown by the flower children in an attempt to escape a very unpopular political reality. The primary proposition (the "hand-in-glove" part) is rarely true. Our planet is far too unstable and unsettled to allow most species time to completely adapt to their environment. By way of example, the current period of global warming is a brief interglacial period in a much larger and profound glacial epoch that began approximately 2.4 million years ago. During this longer period there have been several similar fluctuations of warmer and cooler temperatures, and life on Earth has had to continually adapt to these changing conditions in order to survive. We're constantly playing "catch up," and always just a little behind the leading edge of change. Climate change is used as an example here only because it's a hot topic in the media. Many other examples could be offered such as the progression from disturbed, bare ground to a climax ecology; the evolution of new species forced upon themselves by natural selection; and many more. Another perfectly realistic situation can easily be envisioned where a species survives in its habitat IN SPITE of those conditions because issues such as disease, predators, or environmental stresses kill it off quickly in differing conditions. Or, the species' occupation of its current habitat may even be the result of a physical inability to move to a better environment. Thus, an equally tenable explanation might be that a species survives in its native habitat because conditions are bearable, but far from optimal. And, it does not necessarily have to fit them "hand-in-glove." The species must merely survive and reproduce well enough to balance the mortality rate, not necessarily thrive. Witness as well that there are many, many organisms in nature that are scarce or very rare, and as near as we can tell, have been so for geologic ages. There's a reason for that scarcity. Most commonly it's that these rare organisms are surviving on the fringes of extinction BECAUSE THEY HAVE SOMEHOW EVOLVED TO THIS BALANCE WITH THEIR ENVIRONMENT OR HABITAT. But this is far from an idyllic paradise. These organisms have merely evolved a way to maintain their few numbers in the face of a continuing, raging war with disease, predators, the environment, and the other individuals of their own kind. And, attempting to emulate many of these naturally occurring conditions, referred to at the beginning of this section, in a cage may very likely introduce or amplify inimical or outright lethal qualities, thus tipping the survival balance too far in an organism's disfavour and thereby killing the very creature we're trying to save. Our distant ancestors evolved in the forests and on the grasslands of east Africa several million years ago (coincidentally about the time of the beginning of the current ice age), and over a very long time managed to spread over most of Europe and Asia, and much more recently the New World. They survived an impressive variety of natural calamities such as the last glacial period, supervolcanos, floods, droughts, and famines; predation by giant cave bears, saber toothed cats, wolves, and cannibalism by other humans and humanoids; and infections by a host of parasites and diseases. An additional, very important survival hazard were the internecine wars within our own species that continue even to this day. In our native habitats, the numbers of early Homo sapiens never were very great. It has been estimated that the total number of our species that originally left East Africa to populate the rest of the world may have numbered as few as 150 to 1,000 individuals! (See "Exodus from Africa" in Recent African Origin of Modern Humans.) And, over most of human prehistory there may have been significantly fewer than 1 million, or even 125,000 humans at any one time on the entire planet. For instance, about 70,000 years ago our species experienced a mass die off, a "bottle neck," resulting from the explosion of Mount Toba in Sumatra. Our total population, world wide, may have dropped to as low as somewhere between 2,000 to 20,000 individuals. We don't care what you say, we DO NOT want to go back to living naked on a predator infested savanna or in a disease ridden swamp, giving up our wide screen HDTV, microwave oven, laptop computer, smart-phone, polyester Hawaiian shirts, designer jeans, sports car, and Sheltie dogs because some delusional idealist believes that the habitat that our far distant ancestors evolved in is best for us! And, we are most definitely not convinced that the "Natural is Better" hypothesis works for our tarantulas either. Less Than One Chance in 100! The proponents of the "Natural is Better" hypothesis conveniently choose to ignore the fact that the mortality rate among tarantulas in nature is something on the order of 99%. (See the sidebar The 99% Rule.) That means that on average, perhaps fewer than one out of 100 baby tarantulas manages to live long enough to reproduce! Do not wax idyllic about life in nature. It is still, after all is said and done, a wild, dangerous place where things kill and eat other things, never gently, usually gruesomely; where horrific deaths are just a part of the game, and infanticide is the rule of the day! Thus, we set up a caging and care regimen that meets the minimal requirements of the given tarantula in an effort to NOT kill it off as naturally as possible! No. There is no proof that "Natural is Better" conditions are either necessary or best for any species' survival, especially in captivity, and far too many examples and arguments to the contrary. Scratch that myth. Why it manages to persist in the face of all the evidence to the contrary is way beyond these authors' comprehension! Copyright © 2011, Stanley A. Schultz and Marguerite J. Schultz. This page was initially created on 2011-June-25. The last revision occurred on 2015-January-09.